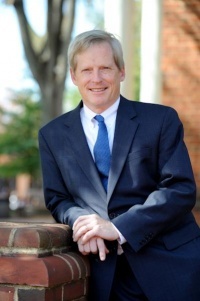 Lloyd Snook is a defense attorney who is a candidate for the Democratic nomination for Charlottesville City Council in the June 11, 2019 primary. Snook served on the Charlottesville Planning Commission from 1981-1989, including a term as chair in 1988-89. He served on the board of directors of the Piedmont Housing Alliance from 2005-2016 and as chair from 2009-2016. Snook served as chairman of the Charlottesville Democratic Committee from 2001 to 2004 and on the party's State Central Committee in 2013. He previously ran for Council, unsuccessfully, in 1990. Snook disavowed then-Congressman Virgil Goode in 2000 in the wake of the latter's switch from Democratic to independent. ↑ Web. Def. Attorney Lloyd Snook Announces City Council Bid, Matt Talheim, News Article, WVIR NBC29, January 10, 2019, retrieved January 10, 2019. ↑ Web. Lloyd Snook Formally Announces Bid for City Council, Matt Talheim, News Article, WVIR NBC29, January 15, 2019, retrieved January 17, 2019. ↑ Web. Meet Lloyd Snook, President of the Board, Piedmont Housing Alliance, March 10, 2016, retrieved 2019-01-18. ↑ Web. Piedmont Housing Alliance Incorporated: Form 990 for period ending June 2010, ProPublica Nonprofit Explorer, June 2009, retrieved 2019-01-18. ↑ Web. Piedmont Housing Alliance Incorporated: Form 990 for period ending June 2016, ProPublica Nonprofit Explorer, June 2016, retrieved 2019-01-18. ↑ Web. Political Fallout, WVTF, May 7, 2013, retrieved 2019-01-17. ↑ Web. Three more candidates plan council campaigns, Nolan Stout, Daily Progress, World Media Enterprises, January 10, 2019, retrieved 2019-01-17. ↑ Web. Letters to the Editor: Lloyd Snook Speaks Out on Virgil Goode, The Home Page of George Edward Loper, January 2000, retrieved 2019-01-17.